A completely new and comprehensive manner of setting up conference rooms. We provide simple and comprehensive conference room AV design and implementation services that have never been seen before. Functional and adjustable premises, high-quality AV furniture and thorough, customer-oriented services from start to finish and even after that. Hannu and Rami, the founders of Presson, were working as AV professionals when they noticed that the audiovisual and office area projects of many companies weren’t carried out appropriately. These projects included several service providers, which made making decisions and advancing the projects slow and cumbersome. In addition, they applied complex solutions and technology that wasn’t always functional. Feeling frustrated, they began to question this way of carrying out projects. When you choose Presson, you don’t need other service providers. We make sure that your premises are functional and serve the purpose they were made for. We only use top-quality products with a proven track record. 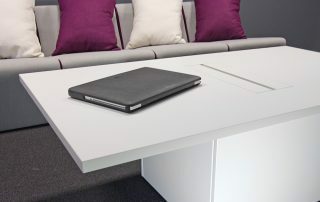 Unsurpassed level of quality, stylish Presson furniture and robust high-quality AV products offer everything someone looking for new conference rooms may need – effortlessly. “All projects begin by surveying the customer’s need and final product carefully. We always provide our services diligently from start to finish, and we never compromise on our installations. We pay particular attention to small details, such as the type of battens or cables to be used, and we always clean up after installations. It is our principle that the end product must be complete and ready to be used, no matter the cost.” – Rami. Adaptable premises – How can you ensure the adaptability of your rooms?